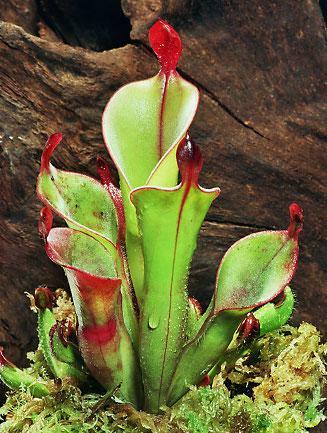 Buy Heliamphora minor and Heliamphora nutans at the FlytrapStore. When early explorers encountered the massive table-top mountains of the highlands at the conjunction of Guyana, Venezuela and Brazil in South America, they could only wonder what might exist on the summits because they were inaccessible, protected by sheer rock walls 1000 to over 3000 feet (300-900 meters) tall. They couldn’t know that on those summits were some plants that grew nowhere else on Earth, including a bromeliad with iridescent leaves and a new genus of carnivorous plant, a unique pitcher plant unlike those of North America and the only genus of pitcher plant in all of South America. It wasn’t until almost a century later, in 1928, that the second species was discovered on another tepui, Cerro Duida, and named Heliamphora tatei. 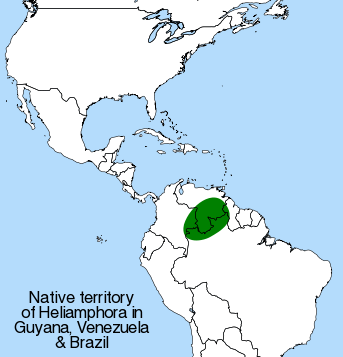 Since then quite a few other species of Heliamphora have been discovered and named, all in the same limited region of South America as shown in the illustration. 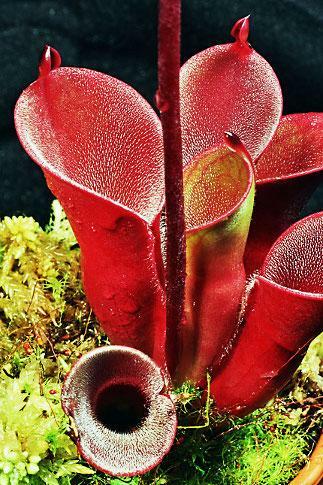 Most Heliamphora live on the plateaus of the table-top mountains (tepuis) in Guyana, Venezuela and Brazil. There are two major ranges of tepuis, a western range and an eastern range, separated by about 300 miles (480 kilometers). This native environment of Heliamphora is both tropical, being near the Equator, and uncharacteristically cool (for a tropical region), being at a relatively high altitude. 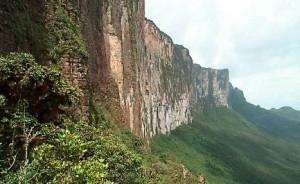 Even the surrounding savannahs at the base of the high tepuis are at 4000 feet (1200 meters) above sea level. The flat-topped mountains or tepuis themselves rise another several thousand feet above these grassy plains, and in fact are above the usual level of the heavy clouds typical of tropical regions. These clouds are diverted upward by the sheer rock walls of the tepuis, causing the top surface of these mountains to be bathed in mists and rains. The landscape at the summits of the tepuis is composed of ancient sandstone weathered by many thousands of years of harsh wind and frequent rain. Everything about the tepuis is on such a massive scale that even the sinkholes, caused by collapsed cave and underground river roofs high in the tepuis are sometimes as much as almost 1000 feet (300 meters) in diameter or depth or both. Although it might seem that this rocky, soilless landscape would be barren or almost so, a surprising variety of plants and some small animals survive in these seemingly hostile conditions. Various species of clumpgrass gain a foothold in the rough texture of the sandstone and in the cracks and eroded shelves and hollows of the rocks, and there are large stands of a variety of species of bromeliad and Heliamphora, although some Heliamphora are specific to just one or two of the 115 tepuis in the region. None of the plants on top of the tepuis are very large or tall, so the many small plants that live on the tepuis usually receive plenty of sunlight, unlike smaller plants in the forests at lower elevations that are often shaded by overgrowing bushes and trees. The “soil” in which all these plants grows is usually nothing more than bits of decomposing dead matter of the various plants themselves, mixed with grains of sand from the eroded rocks and perhaps some dust that might be deposited by wind or rain on the surface of the mountain tops. These materials may settle into shallow hollows or crevices, but there is rarely much of it for plants to anchor themselves to or spread their roots within. Heliamphora pitchers are stiff and hold their shape well against the strong winds at the summits of the tepuis, but they are also brittle and therefore somewhat fragile and easy to tear, break or bruise when not handled carefully, or when shipped. 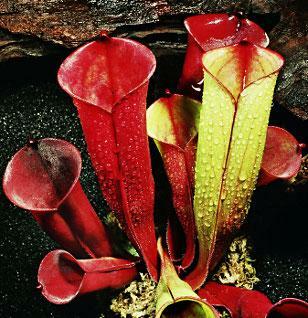 The leaves (pitchers) of most species are green, while a few species have predominately red leaves. Even the green-leafed species usually have prominent red veining, leaf margins and other leaf parts. These pitcher shaped leaves grow each from the inner-most portion of the leaf, where they are all attached to each other by very short (or in some species longer) stems. Other leaves sometimes grow from the axial joints of older leaves, and new plants will offshoot from older ones, giving rise to dense clumps of Heliamphora. The pitchers have downward-pointing hairs which are short and fine with a silky sheen and very numerous on some species, and coarser and longer on others, giving those plants a striking rough and hairy appearance. A prominent feature of the pitchers is the “nectar spoon” usually found in some variation at the uppermost part of the leaf, dangling directly over the pitcher. This nectar spoon (and other parts of the leaves) exude a sweet liquid that attracts insects and invites them to dine directly above a water-filled pit that may represent their death if they aren’t careful. The leaves have a seam along the surface closest to the center of the plant. This seam contains a small slit through which excess water drains, preventing (in most cases) the pitcher from overflowing during a rain and spilling out any insects it has caught. Heliamphora flower stalks produce several flowers that open one at a time during a period of several weeks. The flowers have no true petals; instead, the several petal-like sepals (outer flower parts that usually enclose petals) are called tepals, as they are on other plants such as tulips. H. arenicola – Tremen tepui. Very nice new species. 40-50cm yellow greenish pitchers with a draining hole. Very similar to H.tatei. H. ceracea – Cerro neblinae. 20-30cm green to bright red pitchers with red veins. H. chimantensis — Chimanta tepui. Pitchers 8-14 inches (20-35 centimeters) tall, reddish-green. H. ciliata – Gran Sabana. 10-25cm pitchers. Larger at the base. Quick grower. White hairs on the nectar spoon. H. collina – Foothills Testigos. 25-30cm cylindar greenish pitchers with a helmet like nectar spoon. H. elongata — Ilu and Tramen tepuis. Tall and thin red pitchers 8-12 inches (20-30 centimeters) in height and only 1-1.5 inches (3-4 centimeters) in diameter, helmet shaped dark red nectar spoon. H. exappendiculata — Chimanta, Apacapa, Amuri and Aprada tepuis. Yellow-green or red pitchers 5-10 inches (12-25 centimeters) tall and 1.5-4 inches (4-10 centimeters) wide; nectar spoon is integrated into the pitcher rather than attached to it by a stem or constriction. H. folliculata — Los Testigos range of tepuis. Yellowish or red pitchers 8-12 inches (20-30 centimeters) tall and somewhat flattened looking from back to front. H. glabra — Cerra del Sol tepuis. Pitchers 12-16 inches (30-40 centimeters) tall, without the hairs characteristic of other species in the upper portion of the pitchers. H. heterodoxa — Ptari tepui and in the savannahs surrounding the tepuis, discovered 1951. Pitchers 10-12 inches (25-30 centimeters) tall, deep green; well-developed overhanging nectar spoon. H. hispida — Cerro de la Neblina tepui. Green-and-red or completely red pitchers 6-10 inches (15-25 centimeters) tall; red nectar spoon held upright and bisected with vertical crease. H. huberi – Amuri, Acopan, Apacara and Agasima tepuis. 20-35cm greenish pitchers. This specie can be very hairy. The amuri species have a drain hole. H. ionassi — In the valley between Ilu and Tramen tepuis, discovered 1978. Pitchers up to 18 inches (45 centimeters) or more in height, widely flared at top up to 6 inches (15 centimeters) in diameter, light yellow-green with red veining or highlights. H. macdonaldae – Cerro Duida, Huachamacari and Marahuaca tepui. 20-40cm red veined pitchers. Very similar to H. tatei. H. minor — Auyan tepui, discovered 1939. Small plant, pitchers characteristically 3-6 inches (7-15 centimeters) tall; pale green pitchers with contrasting bright red nectar spoon bent over pitcher and attached by a short stalk. H. minor var minor – Auyan tepui, Cerro la Luna tepui. 10-15 cm green-red pitchers with short white fuzz inside. A deep red nectar spoon. Form big clumps over time. H. minor var pilosa – Auyan tepui, Cerro la Luna tepui. Very similar to h.minor var minor. The 10-15cm pitchers have long white hair in and outside adult pitchers. A beauty. H. minor ‘Aonda Giant’ – Auyan tepui, located near the Aonda cave. The morphological characteristics are very similar to H. minor var minor, except for the size of the pitchers. The upper pitchers are wider, from 5 to 8 cm and can reach the double in height. 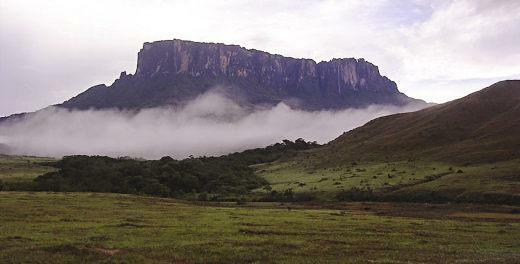 H. nutans — Mount Roraima, Yuruani and Kukenam tepuis, and the mountains at the border of Guyana and Brazil. 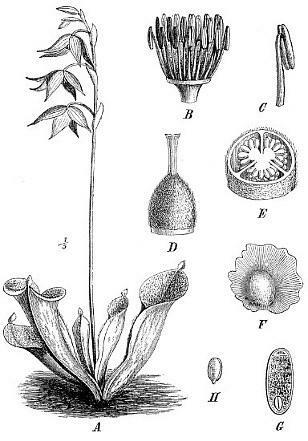 Moderate size with pitchers 6-12 inches (15-30 centimeters) in height; prominent nectar spoon; dark green pitchers edged with red. H. parva – Cerro Neblinae. 20-40 cm lime green pitchers, with bright red edges. Some clones are very hairy outside the pitchers. ‘Conquistador’ style nectar spoon. H. pulchella — Chimanta, Churi, Apacapa, Acopan and Amuri tepuis. Pitchers 3-8 inches (8-20 centimeters) tall and 1-3 inches (3-8 centimeters) wide that are often a very deep red; nectar spoon helmet shaped and attached directly to rear of pitcher (no stalk or basal constriction); hairs inside pitcher are long, almost one-quarter inch (5 millimeters); once considered to be a hairy form of H. minor. H. purpurascens – Ptari tepui. 15-30cm pitchers. Red veins and huge nectar spoon. H. sarracenioides — Ptari tepui. Orange or red pitchers 8-12 inches (20-30 centimeters) tall with a very large, flattened nectar spoon, 1-1.5 inches (3-4 centimeters) wide and 1.5-2 inches (4-5 centimeters) long, reminiscent of the hoods of North American pitcher plants, the genus Sarracenia. H. tatei — Cerro Duida, Cerro Huachamacare and Cerro Marahuaca tepuis. A large plant that requires plenty of room; pitchers are tall, up to 20 inches (50 centimeters) and grow from tough, branching stems up to 5 feet (1.5 meters) long that scramble over the rocks of the tepuis. H. tatei ‘Red’ – Cerro Duida. More uniformly red colored than the other H. tatei. Very short stems. H. uncinata – Amuri tepui. 25-30cm very vertical pitchers. Greenish in the outside, with a deep red nectar spoon. Many nectar glands can be found on the back of the pitchers. H. spec. nov. ‘Akopan’ – Acopan tepui. The description is still under work. H. spec. nov. ‘Angasima’ – Angasima tepui. The description is still under work. And many ultra complex hybrids on Neblinae tepui. 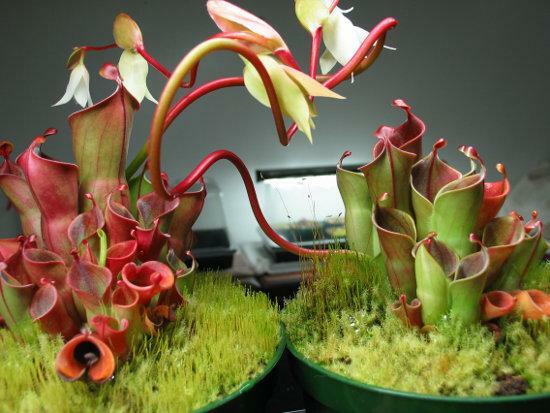 The degree of tolerance and limits Heliamphora has to such things as light (or lack thereof), temperature and humidity are not yet entirely known, so to be on the safe side, many growers try to mimic Heliamphora’s natural habitat to some degree in cultivation. Heliamphora grows at a high altitude in which the temperatures are typically much cooler than in the surrounding lower territory. Its native habitat is near the Equator, so there is not much variation in seasonal temperature and no pronounced winter or summer. It is cool, often cold on the tepui mountain tops, but never freezing. 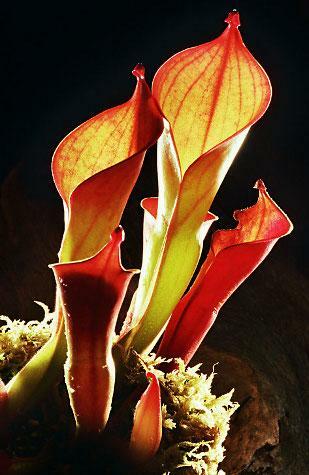 Because of this lack of pronounced seasonal variation and freezing, Heliamphora have no winter dormancy, unlike many temperate carnivorous plants such as Dionaea muscipula (the Venus Flytrap), Sarracenia (the North American pitcher plants), or Darlingtonia californica (the so-called “Cobra Lily,” a pitcher plant native to northern California and Oregon). Equatorial sun is at a more direct angle, and because the plants grow on mostly bare mountain tops among only relatively short and sparse vegetation, they are exposed to a lot of sunlight made more intense by the thinner air at higher altitudes. 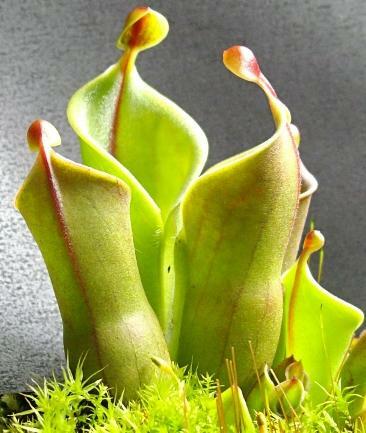 Heliamphora’s adaptation to high levels of light combined with cooler temperatures provides a challenge to growers who may not easily be able to provide both at the same time. Heliamphora may or may not be tolerant of a range of temperatures and light levels outside of those it experiences in its native habitat. As with other carnivorous plants, use only collected rainwater, distilled water or water from reverse osmosis; the water must be free of mineral salts and dissolved solids of any kind. An inexpensive TDS (total dissolved solids) meter can help monitor one’s water supply. Heliamphora are accustomed to a large quantity of direct sunlight, so give them plenty (but see the note about temperature below). 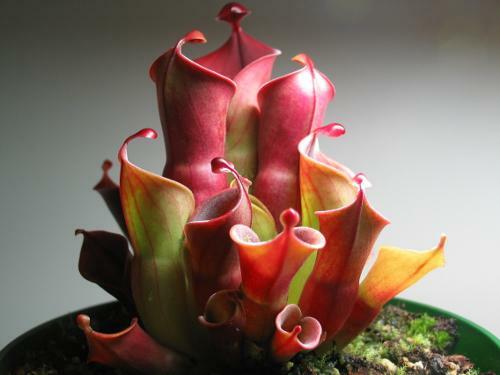 Heliamphora in nature are used to cool and sometimes cold air. If it seems that the temperatures may be too high, it may be advisable to grow it in somewhat shadier conditions until the weather cools again, or until the plants’ tolerance for heat is known in one’s climate. 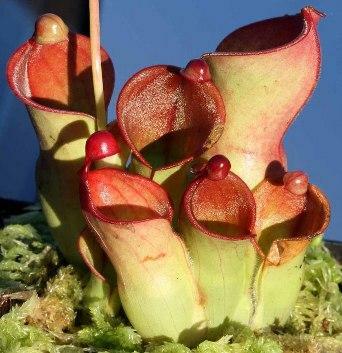 No dormancy is required for Heliamphora, which live near the Equator where there is no real summer or winter, or much seasonal variation in climate. They grow year round and should not be exposed to freezing weather. Seeds — To produce hybrids, Heliamphora must be grown from seed. The stigma (the female part of the flower) becomes receptive before the pollen matures, and ceases to be receptive once the pollen matures, so pollen from another older flower must be used to pollinate a freshly opened flower with receptive stigma. (This happens to be the opposite of the Venus Flytrap, in which the pollen matures sooner than the stigma is receptive.) A successfully fertilized flower will swell and produce mature seeds in a few months. The seeds are never subject to freezing in their native habitat and no stratification is needed prior to sowing. Sow them on growing medium or pure sphagnum peat moss and keep moist and exposed to some light. The seeds germinate in a few weeks, and take several years to grow into a mature plant. Tissue Culture — Strides are being made in propagating Heliamphora in sterile tissue culture, which means that some of the more rare species will become more commonly available as time passes. For information about tissue culture and to learn how might do it yourself, read the Tissue Culture Basics article here at FlytrapCare.com.